Dr Ansari is very thorough, kind and caring. Took an instant liking to her and her style immediately. She is veryeasy to talk to and explained our game plan, what meds she was giving, and the follow up plan. Dr Ansari is very thorough, kind and caring. Took an instant liking to her and her style immediately. She is very easy to talk to and explained our game plan, whatmeds she was giving, and the follow up plan. *** This clinic does not accept self-pay patients. 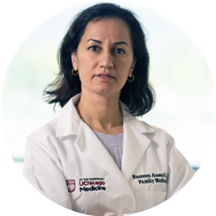 *** As an experienced family medicine physician, Nasreen Ansari, MD, delivers compassionate and comprehensive care. Dr. Ansari believes that preventive medicine is a key aspect in the health and well being of her patients, stressing the importance of: Newborn care Vaccinations Well-child care School physicals Routine gynecological exams Adult health exams Medicare wellness exam, including screenings for diabetes and hypertension. Dr. Ansari also provides chronic care management for multiple diseases such as diabetes, blood pressure, cholesterol and asthma. As part of her comprehensive medicine, Dr. Ansari also has appointments available for sick and urgent care visits, and she enjoys treating patients of all ages, cultures and ethnic backgrounds. In order to best serve you, please remember to provide your unique member ID number on your insurance card for your appointment. If this is not provided, you may expect a call from our office to get that information prior to your appointment so we can verify your benefits. We look forward to seeing you. great very professional and thorough. She and her Physician Assistant were kind and thorough. The wait time for both the waiting room and exam room was short. Dr. Ansari and staff provided excellent professional and courteous care.